DAVID SANCIOUS AND TONE-TRANSFORMATION (THE SPEED OF LOVE). Although David Sancious was a self-taught guitarist, the New Jersey born multi-instrumentalist was a classically trained pianist. David, who was born on November 30th 1953, first started playing piano aged seven. That was the start of David Sancious’ long and illustrious career. David went on to play with rock royalty, including Eric Clapton, Jack Bruce, Peter Gabriel and Bruce Springsteen. Indeed, David was an early member of the E-Street Band, and played on Bruce Springsteen’s first two albums. He made his debut on Bruce Springsteen’s 1973 debut album Greetings from Asbury Park, N.J. However, by then, David Sancious had served his musical apprenticeship. Four years after he took his first classical piano lesson, the eleven year old David Sancious first picked up a guitar. He managed to teach himself the rudiments of guitar. A few years passed, and David had immersed himself in Asbury Park’s music scene. This was the late sixties and early seventies. The Asbury Park music scene was vibrant. At the heart of it, was a teenage David Sancious, Bill Chinnock, Southside Johnny, Bruce Springsteen and future members of the E-Street Band. Along with David, they played in various bands, including Glory Road, Dr.Zoom and The Sonic Boom, The Bruce Springsteen Band and The Sundance Blues Band. Right through until 1972, this was the first part of David Sancious’ apprenticeship. The final part came, when David moved to Richmond, Virginia. As 1972 dawned, David Sancious moved to Richmond, Virginia. His destination was Alpha Studios. David’s new job was a studio musician, who played on jingles and sessions. That was how he met Ernest “Boom” Carter, the E-Street Band’s drummer. This was how David spent two years in Bruce Springsteen’s employ. Between 1972 and 1974, David was a member of the E-Street Band. He played keyboards on Bruce Springsteen’s 1973 debut album Greetings from Asbury Park, N.J.
Recording of Greetings from Asbury Park, N.J. took place between July and September 1972. Four months later, on January 5th 1973, Greetings from Asbury Park, N.J. was released. It was well received by critics, and nowadays, features in Rolling Stone magazines list of 500 best albums of all time. Despite this, Greetings from Asbury Park, N.J. wasn’t a huge commercial success. On its release, Greetings from Asbury Park, N.J. reached just number sixty in the US Billboard 200 charts. Little did anyone know that this was the start of the career of one of the most successful American musicians ever. Even David didn’t appear to realise this. After Greetings from Asbury Park, N.J. was recorded, he didn’t head out on tour with Bruce Springsteen. Instead, he returned to Alpha Studios. At Alpha Studios, David recorded some demos with drummer Ernest “Boom” Carter and bassist Garry Tallent. There was a problem though. The rights to the demos that the three members of the E-Street Band recorded, were owned by producer and songwriter Will Farrell. These would become a bone of contention, when they were later released without David’s permission. That was still to come. Before that, David would play on The Wild, The Innocent & The E-Street Shuffle. Recording of Bruce Springsteen’s sophomore album, The Wild, The Innocent & The E-Street Shuffle took place between May and September 1973 at was re914 Recording Sound Studios. It was the perfect showcase for David’s skills. On The Wild, The Innocent and The E-Street Shuffle, David talents as a multi-instrumentalist shines through. He played piano on New York City Serenade, organ on Kitty’s back and a soprano saxophone solo on The E Street Shuffle. That’s not all. During instrumental breakdowns, David enjoys the chance to showcase his versatility. Drawing inspiration from his eclectic musical taste, he takes The Wild, The Innocent & The E-Street Shuffle on unexpected directions. In doing so, David played his part in Bruce Springsteen’s first great album. When The Wild, The Innocent and The E-Street Shuffle was released in September 1973, it was too widespread critical acclaim. So much so, that The Wild, The Innocent and The E-Street Shuffle features in the Rolling Stone magazines list of 500 best albums of all time. Sadly, this didn’t translate into sales. The Wild, The Innocent and The E-Street Shuffle stalled at just number fifty-nine in the US Billboard 200 charts. Although slightly better than Greetings from Asbury Park, N.J., it was a disappointing chart placing. Maybe this is why David’s time with The E-Street Band was soon at an end. David toured with The E-Street Band from June 1973 right through to August 1974. He also played on the title-track to Bruce Springsteen’s third album Born To Run. However, David was about to leave the E-Street Band, albeit not for ever. Having left The E-Street Band, David and drummer Ernest “Boom” Carter formed their own group Tone. The third member of Tone was bassist Gerald Carboy. Other members would come and go. This would include vocalists Gail Boggs, Patti Scialfa, Brenda Maddison and Gayle Moran, of Return To Forever and The Mahavishnu Orchestra. Another future member of Tone was Alex Ligertwood, who’d become Santana’s vocalist. These vocalists were part of Tone’s fluid lineup. Their debut album was Forest Of Feeling. For David Sancious and Tone’s debut album, 1975s Forest Of Feeling, they decided to change direction from the music they’d been making with Bruce Springsteen. To do this, they brought onboard a producer capable of making this happen. Billy Cobham of The Mahavishnu Orchestra was brought onboard to produce Forest Of Feeling. Their debut album saw David Sancious and Tone’s music move in an innovative direction. Progressive rock and jazz fusion melted into one on Forest Of Feeling. There was more than a nod to The Mahavishnu Orchestra, Yes and Genesis. A captivating fusion of musical genes and influences, Tone’s debut Forest Of Feeling, was released in 1975. On its release in 1975, Forest Of Feeling was well received by critics. They realised that Forest Of Feeling was an album of groundbreaking music. It was very much a mixture of music’s present and future. Despite this, Forest Of Feeling failed to chart. For David Sancious and Tone this a huge disappointment. So they started work on their sophomore album, Transformation (The Speed Of Love), which was reissued by Esoteric Recordings. Transformation (The Speed Of Love). For Transformation (The Speed Of Love), David Sancious and Tone’s sophomore album, David penned four tracks. They were Piktor’s Metamorphosis, Sky Church Hymn #9, The Play And Display Of The Heart and Transformation (The Speed Of Love). These four lengthy pieces were the perfect showcase for David Sancious and Tone. Recording of Transformation (The Speed Of Love) took place at Caribou Ranch studios with Bruce Botnik producing. David played acoustic piano, Fender Rhodes, piano plus Hammond and electric organ. That’s not all. A true multi-instrumentalist, David also played Moog synth, clavinet, electric and acoustic guitars. Ernest “Boom” Carter played drums, percussion and added the vocal on Piktor’s Metamorphosis. Gerald Carboy played bass and wind chimes. Gayle Moran sang the vocal chorus on Transformation (The Speed Of Love), an eighteen minute epic that closes the album. Once these four songs were recorded, Transformation (The Speed Of Love) was released in 1976. On Transformation (The Speed Of Love)’s release, it was released to widespread critical acclaim. A genre-melting album, everything from blues, boogie, classic rock, psychedelia, funk, fusion, jazz, progressive rock and rock feature on Transformation (The Speed Of Love). It’s three hugely talented musicians showcasing their considerable talents. Despite this, commercial success eluded Transformation (The Speed Of Love). Transformation (The Speed Of Love) failed to chart. It passed record buyers by, upon its release in 1976. Since then, Transformation (The Speed Of Love) has found an audience within the rock and jazz community. You’ll realise why, when I tell you about Transformation (The Speed Of Love). Opening Transformation (The Speed Of Love) is Piktor’s Metamorphosis. A melancholy Fender Rhodes plays slowly and thoughtfully. Tenderly, wind chimes make their presence felt. Soon, the track heads in the direction of fusion. Starting slowly, it’s a laid back track. Just scatted harmonies accompany Tone. Then Tone kick loose. The rhythm section and scorching guitars drive the arrangement along. David’s guitar are at the heart of the arrangement. His fingers fly up and down the fretboard, as he draws inspiration from fusion and rock. However, Tone aren’t a one man band. Ernest “Boom” Carter’s drums and Gerald Carboy bass play important roles. Especially the pounding, probing bass. Along with David’s blistering, searing, guitars, it plays a starring role during this musical roller coaster that veers between laid back and melancholy to raucous and rocky. Sky Church Hymn #9 sees Tone head in the direction of the blues, as they pay homage to the late, great Jimi Hendrix. Early on, there’s even a country and rock influence. Mostly, though, the blues are the starting point as Tone get into the deepest of grooves. After a couple of minutes, it’s time for Tone to stretch their legs musically. This is the signal for David to unleash some scorching, rocky guitar licks. He goes toe-to-toe with Tone’s rhythm section. They match him every step of the way. Soon, the track becomes a funky slice of boogie, with more than the merest hints of psychedelia. Later, fusion is the next genre Tone make a fleeting visit to, on a truly genre-melting homage to a musical legend, Jimi Hendrix. The Play And Display Of The Heart sees another change in direction. A wistful piano plays. David unleashes some flamboyant flourishes, before the track returns to what’s almost a fusion modern classical and jazz. He duets with himself on acoustic guitar. This is a compelling combination, where David becomes a one man band. After three minutes, David injects drama and flamboyance. Elements of classical, jazz and rock shine through on what’s a truly beautiful track. Closing Transformation (The Speed Of Love), is the title-track, an eighteen minute epic. It took up the entire second side of the original album. As the arrangement unfolds, it’s almost discordant. You wonder what’s about to unfold. It’s best described as heading in the direction of ambient, avant-garde, experimental and free jazz. This is a brief detour. Then Tone become one and get down to business. The track heads in the direction of fusion and progressive rock. In full flight, the rhythm section, propelled along by the bass provide the backdrop for a vampish Hammond organ. Then sci-fi synths signal a breakdown. A lone Fender Rhodes meanders across the arrangement. Boom Boom marks time, as if desperate to kick loose. When he does, he and the rest of Tone become a tight, progressive band. As the tempo increases, they showboat their way through what’s the album’s highlights. It’s another musical journey, one where drama and melancholy are ever-present. Adding to that is Gayle Moran’s ethereal vocal, during the chorus. It plays a part in David Sancious and Tone’s musical Magnus Opus where beauty, drama, darkness, joy and melancholy make their presence felt. 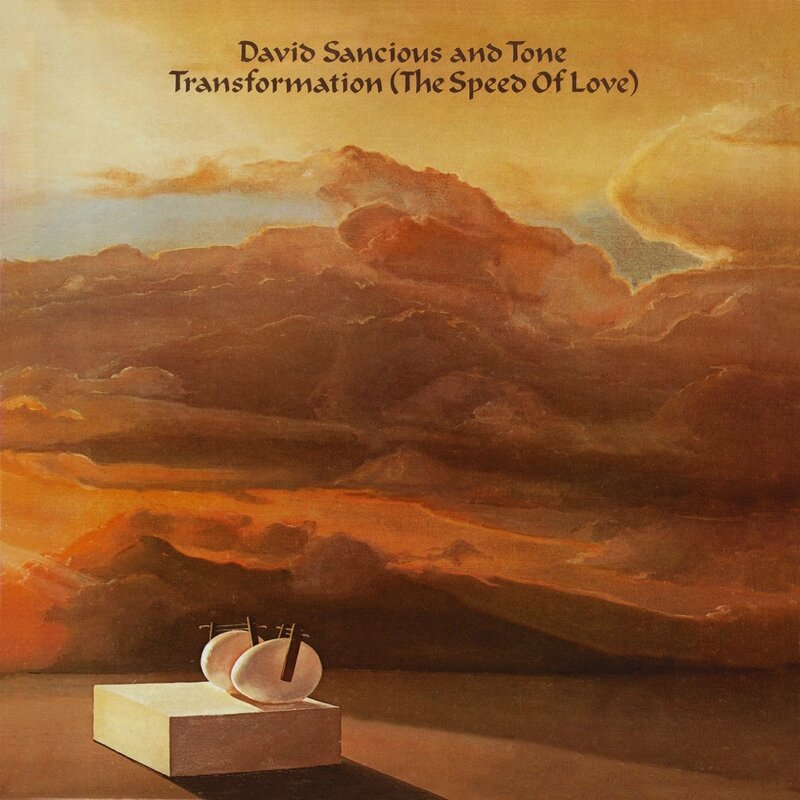 Transformation (The Speed Of Love), David Sancious and Tone’s sophomore album was their finest moment. Sadly, they were neither a prolific nor successful group. Indeed, they only released two further albums, 1977s Dance Of The Enlightenment and True Stories. Just four albums are the sum total of David Sancious and Tone’s discography. For the newcomer to David Sancious and Tone’s music, then Transformation (The Speed Of Love) is the place to start. Quite simply, Transformation (The Speed Of Love), is an innovative, genre-melting album. During the four tracks, elements of ambient, avant-garde, blues, classical, experimental, funk, fusion, jazz, progressive rock, psychedelia and rock are combined by three hugely talented musicians. Seamlessly, the change direction. They’re able to do this, because they’re versatile musicians. However, David Sancious and Tone were hardly musical veterans. David was just twenty-three when Transformation (The Speed Of Love) was released. However, he’d spent a lifetime making music. That’s apparent on Transformation (The Speed Of Love). Whether he’s playing guitar, piano or organ, David Sancious is a truly gifted musician. Accompanying him are two talented musicians, drummer Ernest “Boom” Carter and bassist Gerald Carboy. Their contribution to Transformation (The Speed Of Love), which is something of a hidden gem, is equally important. Recently, Transformation (The Speed Of Love) has been reissued by Esoteric Recordings. This will allow a new generation of music lovers to discover David Sancious and Tone’s captivating and genre-melting album Transformation (The Speed Of Love).